Mr. William Binkley has just completed his 30th year as a Music Education Specialist at Glen Acres and Exton Elementary Schools in the West Chester Area School District. There, he teaches the String Orchestra Curriculum to students from 3rd to 5th grade. Mr. Binkley has taught private violin and viola lessons as well during those 30 years. He is also an active performer on the violin. Mr. Binkley freelances as a classical violinist and has performed the Lancaster Symphony, the Pottstown Symphony and the Kennett Symphony. 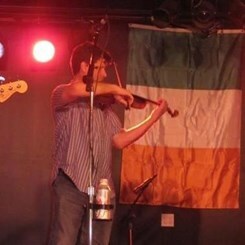 Currently he is a fiddler for The Paul Moore Band, a Philadelphia-based Irish band... In his spare time, he is an avid runner, kayaker and fisherman.